George Monbiot’s arrestblair.org campaign awarded me with a bounty of £2,420.89 this week for my attempted arrest of Tony Blair. This comes on the day Desmond Tutu refused to share a platform with Blair. Article: ‘Why I Arrested Tony Blair’. The sum will be converted to Hong Kong dollars and donated to: The Palestinian Centre for Human Rights, Democracy Now!, West Sahara Resource Watch, Students for Justice in Palestine National Conference and others. Receipts will be collected here over the following week. The Guardian (final bullet point). Press releases, footage and photos here. Below is a piece for New Internationalist Magazine. 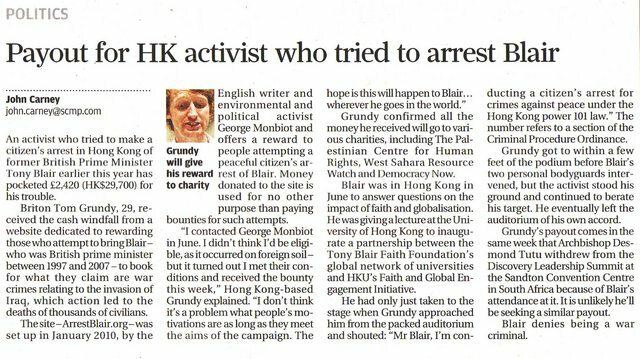 Last Thursday, I attempted a citizen’s arrest of Tony Blair for crimes against peace as he was about to present a speech at Hong Kong University about faith. It seems particularly dubious for the ex-British Prime Minister to address the subject of religion, as he has done so much to enrage the Muslim world and thus set back religious tolerance by decades. Some will find the comparison absurd but there is little moral difference when the products of their respective leaderships were mass human rights violations against civilian populations. Blair has requested that people “move on” from the Iraq War yet, with documented civilian deaths now totalling at least 107,013, leading QC Michael Mansfield has confirmed that there now appears to be enough evidence to trigger an ICC investigation. Legally, the type of weaponry deployed in the war (depleted uranium and cluster bombs) can be described as ‘indiscriminate’, thus making him liable for mass civilian causalities. Interviews/coverage: RTHK, The Standard, Time Out and South China Morning Post locally. Huffington Post UK, The Guardian, BBC News, The Independent and The Telegraph in the UK. Democracy Now in the US. 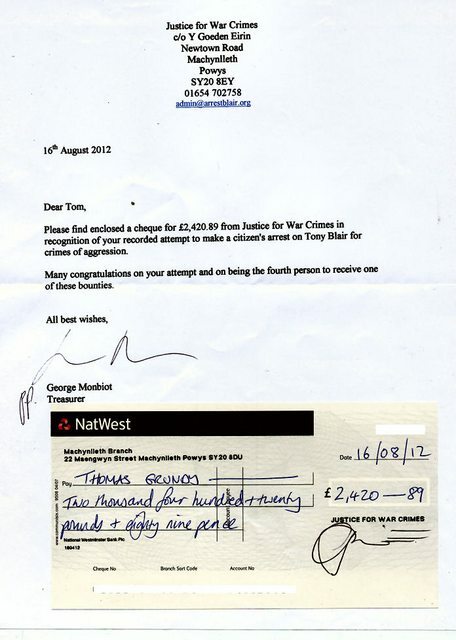 Update 2: I am eligible for a share of the ArrestBlair.org ‘bounty’ offered to those who attempt a citizen’s arrest of Mr Blair. I will donate the sum – of around £2400 – to relevant charities (including the Palestinian Centre for Human Rights in Gaza). The site was founded originally by British Guardian journalist and writer George Monbiot. Tom on Reuters (video), on TVB (video) Sina (press), CRI English (radio) and a longer quote on RTHK 3 (radio) after the Exchange Square protest on 15.10.11. 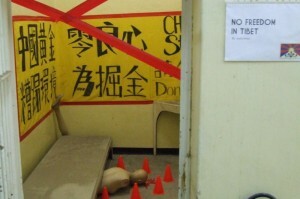 Also, a report from the South China Morning Post on the HSBC commune, 23.10.11. 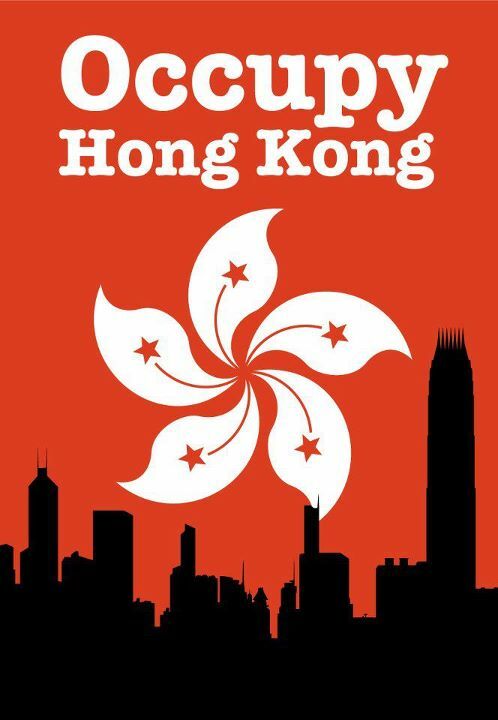 At a time of deep cuts and austerity measures in Europe and the US, booming Hong Kong is enjoying such a surplus that the government is offering personal US$700 bail-outs to all residents, subsidising electricity bills and allowing families in public housing free rent for 2 months. However, not all is as it seems beneath the Tiger Economy’s glittering skyline. 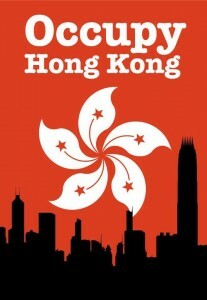 Last Saturday, over 300 ‘Occupy Hong Kong’ activists gathered at the city’s Stock Exchange. As the freest economy in the world and the third most favoured tax haven, one would doubt that the thriving ‘Capital of Capitalism’ would have seen anything of the Occupy Wall St movement. However, the turnout exceeded all expectations as demonstrators were keen to raise awareness of the territory’s shameful growing income disparity. This weekend, Christina and I smuggled a protest banner we’d used at the HK Stock Exchange into a government-sponsored art exhibition in Central. Our ‘re-contextualised guerrilla art installation’ was inspired by a 2005 Banksy stunt and Mark Wallinger’s 2007 recreation of Brian Haw’s anti-war placards at The Tate. Last week, China Gold International (2099/ TSX: CGG) floated on the Hang Seng. Protests accompanied the Canada-based/China-owned company’s simultaneous HK$2.4 billion ($309 million) IPO on the Toronto exchange too. 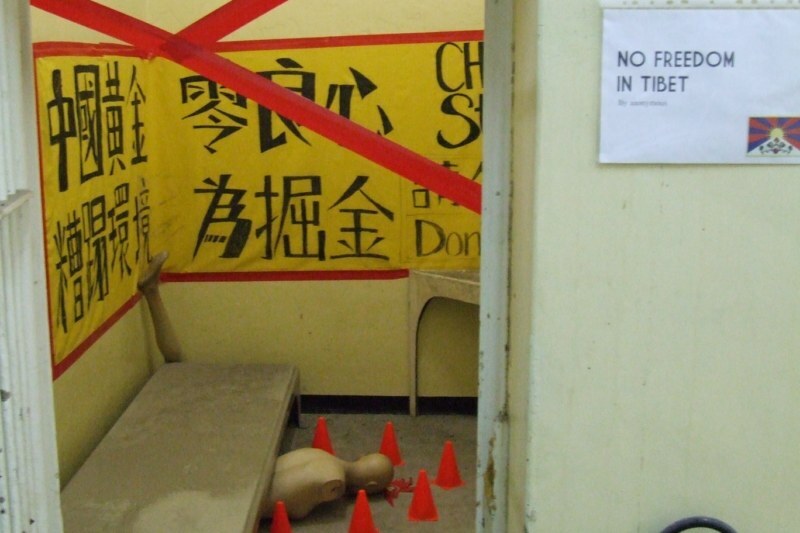 Since 2009, Tibetans near the GGI Gyama copper mine have protested water contamination, pollution and forced settlement of nomads. Two farmers, Sonam Rinchen and Thupten Yeshi were tortured and sentenced for up to 15 years in prison for demonstrating. Richen died as a result of repeated torture. More info here / our press release.